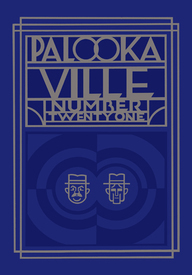 In this, the twenty-first issue of cartoonist/illustrator/designer Seth's (almost) annual, Palookaville, we have another elegantly designed hardcover volume. Between the two embossed covers – which show Seth moving closer to Deco stylings – readers will find three "sections" containing: the continuation of the fourth installment of Clyde Fans; selections from the seventh and eighth volumes of Seth's "Rubber Stamp Diary", and the first forty pages of "Nothing Lasts", a tale taken from "Sketchbook 10." It pretty much goes without saying that this is a must for all fans of Seth's work. To anyone yet to sample his wares, all we have to say is, "What are you waiting for?"